Innovate: rearrange these old odd letters, pry and unwind, then focus in, reform and say them. I wrote it. It’s a challenge for you to write an anagram from its own letters, similar to the one the Christian Bök faced in the image below. This might be my favourite anagram of all time. How well the two texts work individually, but then interweave together in a magical way to improve each other — it’s true love folks, in words, right there. But the problem with the anagram is that it’s so elegant, it doesn’t seem difficult, and the difficulty is where some of the beauty of the anagram lies. Runner’s might be familiar with this problem. Rudisha looks so smooth, graceful, and in control during his World Record 800m run at the London Olympics that the magnitude of the feat isn’t explicit. Does it really look like the fastest 800m ever covered by a human on foot? Do you really understand how fast it would feel if you ran at that pace? Something’s lost in translation. “Two Equal Texts” is a little more explicit in explaining why it is impressive, but not all the details are flushed out. Unlike the challenge I present to you, in Bök’s anagram not only the letters are restricted, but also the punctuation marks, which puts heavy restrictions on the syntax. You could come up with a brilliant sentence, but only have to scrap it in its entirety because, GAH! this dependent clause requires a comma that you just don’t have. And since anagrams are so finely tuned, you might not even be able to hone your anagram to work. Sometimes it’s easier, instead of trying to fix an anagram, to clear the slate and start afresh at square one. Try a new path. I first encountered the work of Bök in Grade 10, when my English teacher mentioned his best selling book of poetry Eunoia (read it here). Eunoia (the shortest word in the english language to contain all five vowels, meaning “beautiful thinking”) caught my attention because it was lipogrammatic, meaning the writing was constrained by omitting letters, the type of challenge you’d face if a few keys on your keyboard all of sudden stopped working. In this case Eunoia restricted itself to only one vowel per chapter. The first chapter, Chapter A, begins “Awkward grammar appalls a craftsman…” banishing E, I, O, U and Y from its entirety. There’s a Chapter E, I, O, U, and even Y has a brief solo performance called “And Sometimes”. The next year, I encountered him again, when my English class was given a fairly open-ended assignment to do something involving an essay and a translated poem. I didn’t know what poem to write on, and so my teacher suggested I look through a Canadian anthology of translated poetry. I flipped through, and one poem really stood out to me. It wasn’t in English. I wasn’t even sure if it was a poem. It was just lines of uppercase vowels on the page. I flipped around, trying to figure out exactly what the vowels meant. This “poem” was part of Christian Bök’s series of translations of Arthur Rimbaud’s “Voyelles”, all translated in different ways. One he homophonically translated, so that the two poems would sound alike when read aloud, although Rimbaud’s is French and Bök’s is English. Another he homovocalically translated, preserving the sequence of vowels in Rimbaud’s poem, but using different consonants (for example, Bök replaces “A noir, E blanc” with “Phantoms, infernal”, both having the vowel sequence AOIEA). He composed an anagram of “Voyelles”, and he also did the traditional translation, maintaing the rhyme scheme and semantic meaning. From this last translation, the mysterious vowel poem was born, by stripping the traditionally translated “Vowels” of its consonants, spaces, and punctuation, leaving only those upper case vowels. By doing so, Bök was implying that the real poem exits in the vowels. It was these personalities that Bök hypothesized the Rimbaud translations and Eunoia would showcase, and Eunoia really does bring those vowels to life. There are reports of the book being too intense for some people with synesthesia, so unnaturally super-saturated with a vowel that it’s hard to look at. There’s a version of the book made with the text on one side, and a colourful imagined visualization of the text on the page opposite, which tries to replicate what that synesthetic experience might look like. There certainly is something visually stunning about the book, open to any page and you’ll find a unique feng shui to the words, a zen-like quality to the simplicity of the vowels that’s oddly meditative to just look at as you would a painting. But if I go to read it, although it is very fun and lively, Eunoia exhausts me. The univocalic pounding of the text is enough to stress-fracture your eyeballs, and especially with Chapter U, the constraint eliminates so many syntactically essential words that the sentences gasp for air, and the rhythm suffocates. But that’s part of U’s character, and you have to grind through the reading in the same way that Bök ground through the writing of it. Certainly reading Eunoia comes nowhere close to the difficulty of writing it, and the difficulty is important. Bök often mentions that he read Webster’s three volume dictionary five times to compile useable wordlists, and spent 6 years, writing for five or six hours every day after his day job at the University of Calgary to complete the book, which weighs in at under 120 sparsely filled pages and allegedly exhausts 98% of the english univocalic lexicon. He describes Eunoia in his afterward as making a “Sysiphusian spectacle of its labour”, calling for it to be judged and appreciated as the product of the amount of work that went into it, not for just the book itself. He’s gotten what he asked for. There’s hardly any discussion about what is actually in-between the covers, other than the letters left out. People talk about whether it counts as poetry, if it is literature or just a gimmick, whether its good or not, and whether a book like it could ever be good or not, but never the miners drilling for zinc in Chapter I or the fiery fling of Ubu, Ruth, and Lulu in Chapter U. That makes it a very different type of book. It’s the concept of Eunioa. The process of Eunoia. Bök is a machine that writes according to such restrictive formal constraints that he becomes almost algorithmic, and appreciating the amount of work that goes into his poetry is akin to appreciating the work of a computer. They both labour to come up with a small output that represents an answer. Can you write a book with a single vowel? Does each vowel carry with it a personality? More than what he writes, it’s how he writes, and why he writes it. 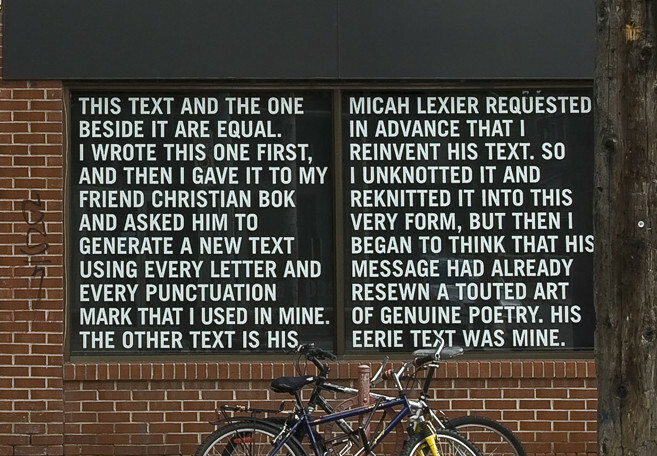 It’s the concept behind the experimental work that really matters, “experimental” literally: his poetry is actually an experiment into the limits and nature of language. This concept behind Eunoia is so strong I believe it’s possible to have an insightful discussion about the book without having ever read it. Although it’s Bök’s job to make what’s in it as good as he can, and the book is more successful if what is in it is good, even if he had failed, and had been unable to produce meaningful language under the restrictions, that still would have been meaningful. In a world of byte-sized sound-bits, works as high concept as Eunoia are easier to latch on to than a delicate, detailed emotional debacle. Eunoia was immensely successful, it became the best selling book of Canadian Poetry of all time (but maybe that’s not saying much). Sometimes you need something as curious as book using only one vowel at a time, or a page filled with vowels and called translated poetry to get people to bite. In an author’s note placed above that uppercase vowel poem, Bök asked that someone fix a new poem around these constrained vowels, suggesting that the two poems might have the same character. After reading about all of this, about synesthesia and the characters of vowels and analytical quasi-scientific investigations into language, I was hooked. I would write Bök’s requested poem from the vowel skeleton I had stumbled upon. In other words, I would write a new poem by inserting consonants, spaces, and punctuation as I wish, but I could not, under any circumstances add in a new vowel, or change the ordering of the vowels in any way. If I stripped my text of consonants, spaces, and punctuation, it must exactly match Bok’s “Vowels” stripped. I also added the constraint that my poem must maintain the rhyme scheme of the original French “Voyelles” (ABBA BAAB CCD EED), because why not? This was a high-school science experiment. I fiddled away, distilling words, taking a microscopic eye to their every letter, writing, then erasing, then writing again as I pieced together a poem in exactly the opposite way that Michelangelo sculpted. He chipped away any stone that wasn’t part of a sculpture, I added any words that were part of a poem. It was writing unlike I had ever experienced it, painfully slow, two steps forward, and then twelve back once you’ve written yourself into a corner and no word will fit. It took longer than I thought it would, but I did it. I wrote a poem with the same vowel sequence as Bök’s “Vowels”. It was an okay poem, but those vowels were precisely the same, and for that I was very proud. A A man that can act badass and can act as warm as a bath. E The speech empress, she flexes, stretches, bends. She’s clever. She’s endless. Hell freezes: she never lessens, keeps here. I is chic, kind, living in high spirits. O Orthodox common folk who work lots on odd jobs, or who woo and howl on show floors. U lustful, gruff, burnt dung… truthful but dumb. I might not have really bought the whole vowels have a personality thing had I not have tried it. You can’t learn better than you can from experience. Sure, you can talk about Eunoia intelligently without having read it, but once you’ve read it aloud, and played around with the words in your mouth “a slapdash arc and a backwards zag” there’s an all new kind of understanding, and more too when you’ve sat down and tried to write with vowel constrictions. I respect and admire Bök’s poetry much more now having tried it myself, as I appreciate the work required to write as eloquently as he does, and the magnitude of the accomplishment to finish it. It’s the same problem with appreciating running. You might think you know the speed that world’s best run at (uh… fast? ), but you won’t have the full depth of appreciation until you try the pace yourself. This is one of my favourite running videos, and kudos to Asics for the idea: they put normal people on a treadmill going Ryan Hall’s American Record marathon pace (2:04 marathon, 4:46 per mile) just to see what happens. They don’t last long. Some of them can’t sprint that fast and fall over immediately. Some last 30 seconds. But Ryan Hall runs that fast for over two hours, and let’s bear in mind that this is still slower than world record pace (although not by that much). Go forth and run and end an easy two hundred meter interval in thirty seconds for me please. Again, it’s a challenge, and it’s of personal significance: this year, before my untimely, and season-ending injury, I trained towards running 200m in under 30s a little over eight consecutive times. In other words, I was working towards running a sub four minute mile. It’s a pace that’s close to my heart. A little over a lap. A little under a minute. Who doesn’t like even numbers? For men, the four-minute mile is sort of a benchmark separating professional and amateur running, and for women, running half of that, 800m in under two minutes, is truly world class. So go ahead, try an eighth of a mile at 4 minute pace. Half a lap in half a minute. Remember, this is one of the sentences that will Change Your Life*, or at least, give you an appreciation for elite track and field. And now, as promised, allow me to Blow Your Brain*: the second sentence also happens to be an anagram of the first. I take my bow.